In this post, I'll try to show you how the knitting machine works. 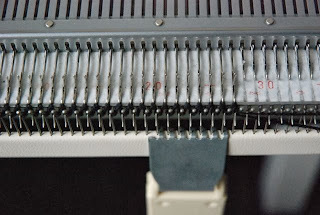 I'd like to say, though, that if you consider buying a knitting machine, you should make sure you either get one which comes with its manual or you can get instruction on how to use it. If possible both. I started out with just the manual and I have to say that most things I tried based on that went wrong about twenty times before they started to go right. Sometimes that was because I didn't properly understand the lingo yet, sometimes because there is only so much anyone can show in text and pictures, sometimes because the instruction were a bit sparse and often because I had yet to develop a feel for this thing. It was a bit of a struggle and I'm sure I wouldn't have been able to figure it out without the manual. 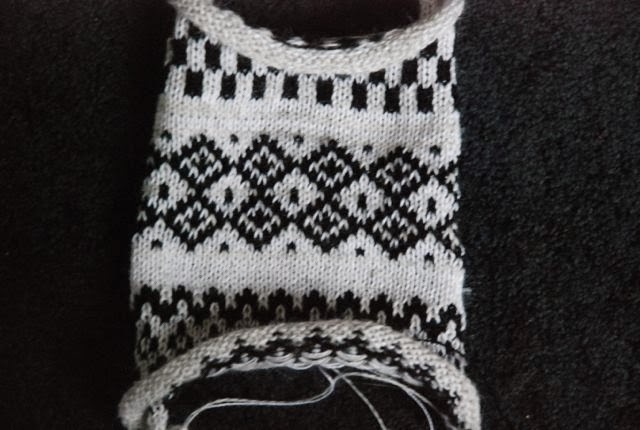 When, on to knitting. 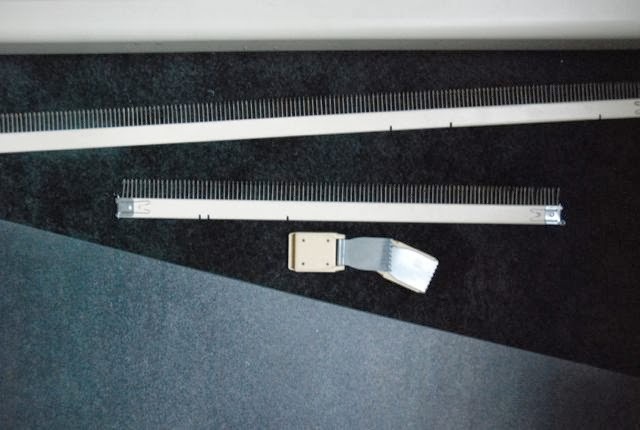 Let's assume the machine is safely installed on a table and the sled with the thread guide are in place, like I showed in the last post. Position the sled at the right side of the needle bed. To start knitting, you have to move those needles you want to use forward like this. 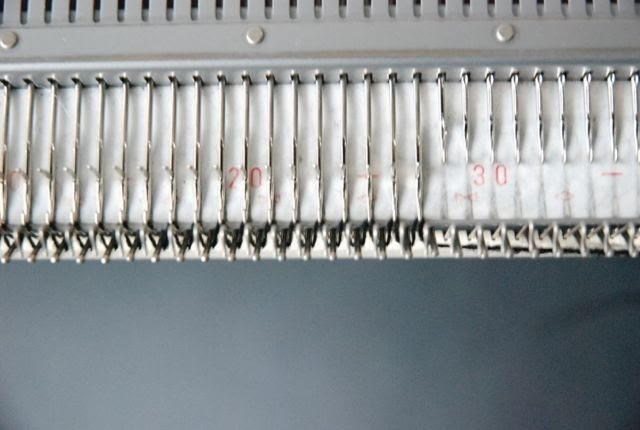 Then, you can hang the comb between the needles. 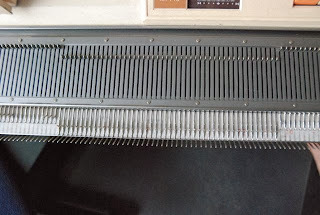 It attaches to the underside of the machine with two twisting bits of metal at either side. 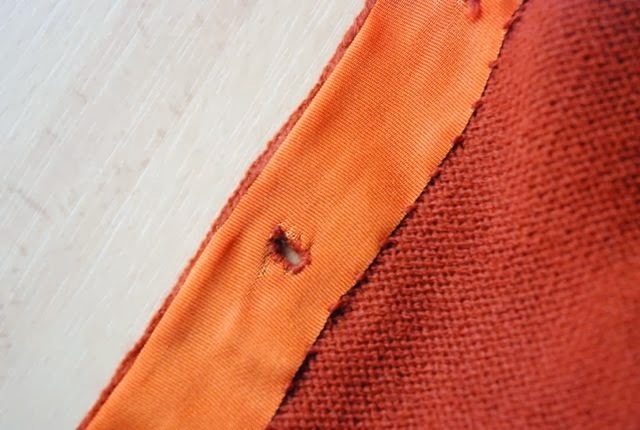 There are other ways of setting up stitches, but this is the easiest one and the most appropriate one if you just want to try it out. 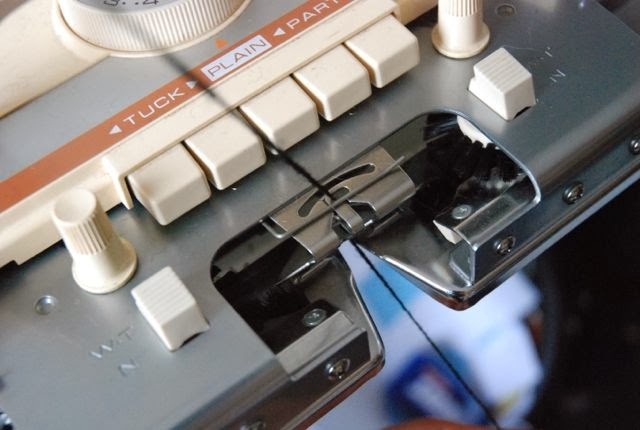 Release the thread from it's resting position on the shaft of the thread tension unit and pull it into the hole in the thread guide on the sled. Pull on it until you hear the click which indicates you've inserted it in the hole at the bottom as well. Hold the loose end at the bottom. If you don't the tension will pull it out. Now, you can, gently, move the sled to the left. It should form a kind of zigzag between the needles you pulled forward and the teeth of the comb. 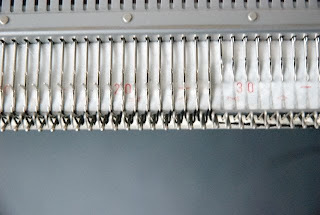 Release the comb from the machine and let it hang just by that zigzag of thread. 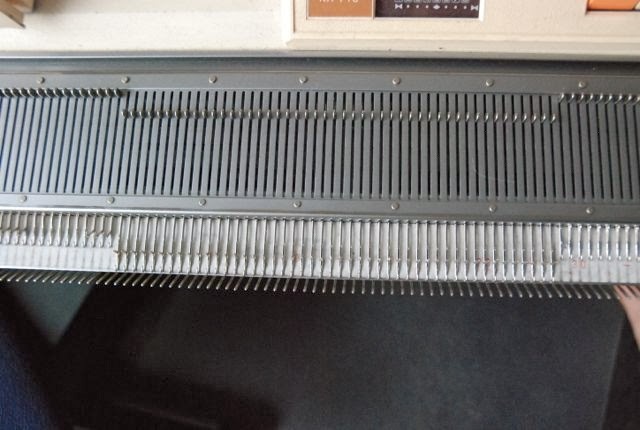 Hang the weights on the comb. Move the sled back from left to right. 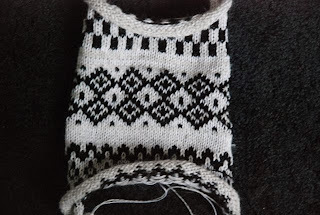 This time, loops form around the zigzag and at this stage, you may recognize knitting stitches. And that's all there is to it. 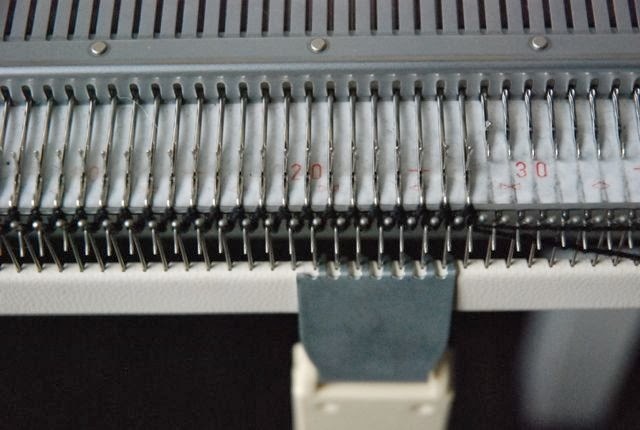 Moving the sled back and forth over the needles creates normal flat knit. To increase the amount of stitches you just pull out more needles and to decrease, you hang two stitches on one needle (it takes a bit more trouble to decrease more than one at a time though. A bit more trouble, not a lot). The experience of knitting in this way is, I guess, probably more like weaving that like hand-knitting. 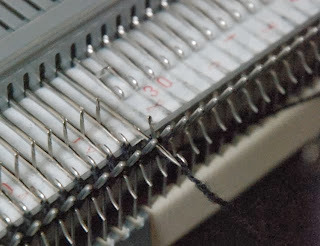 It pushes the needle forward so the stitch(=loop) which is on it is pushed back over the moveable lip of the needle. Then, the thread from the thread guide is pulled over the extended front of the needle. Getting caught there when the needle is pushed back again and the loop pushed the lip forward. When the loop is pulled over lip, it slides from the needle and has become the next stitch and a new loop hangs in the hook of the needle. When you move the sled, its parts make one needle after the other go through these motions. It works great. If it all works. That's something to watch out for: in order to go through the motion of knitting properly, each needle must be able to open all the way and close all the way. And to do so easily and smoothly. Needles which don't either cause dropped stitches or the piling on of loops. Those have to be replaced. I hope this has clarified the process a little. I will continue in a next post about gauge, fancy stitches, patterns and other less hardware-minded things. 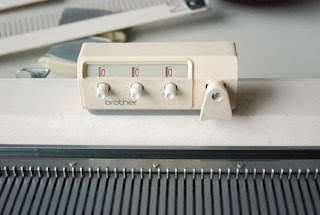 This post I promised you, about the knitting machine and how to work with it, got me a bit worried. I'm only a novice at this after all. And yet, with so many people owning but not using knitting machines and yet so many others considering them, I thought I'd give it a go anyway. 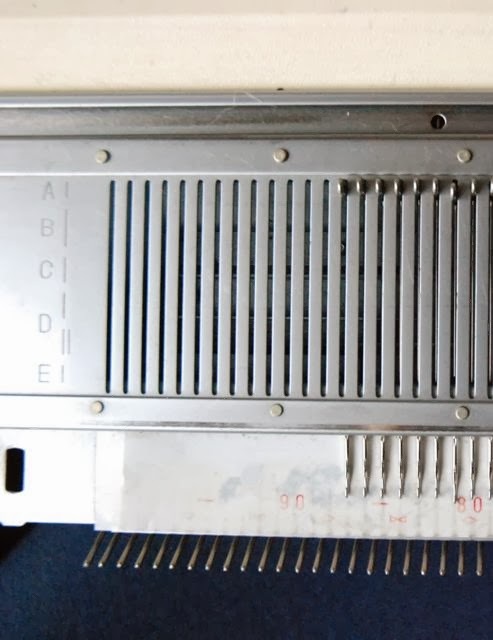 In this post, I'll show you my knitting machine and try to explain a bit about the various types of machines you may come across. More information about working with it will follow later. As I've told before, I bought my machine quite cheaply through a local auction site (a Dutch Ebay, basically). 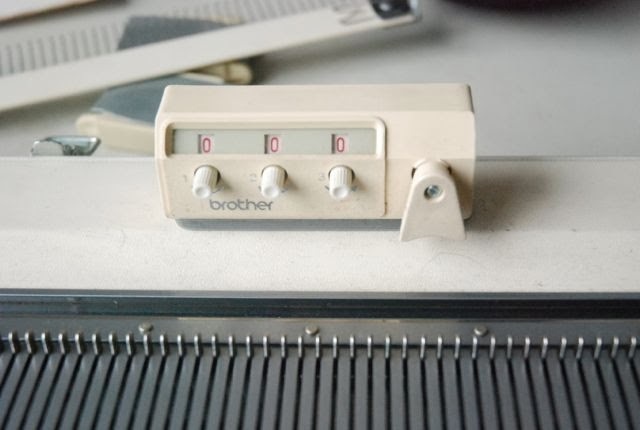 When I did so, I really didn't know anything about knitting machines. I just didn't want to spend much and this was one of the more elaborate machines which were for sale at a really low price. Now I know that knitting machines were really popular from the 1950's onwards. A lot of the really vintage-looking Knittaxes and Passaps which I found must have been from that era. Many of the really old machines, including mine, were sold by people who didn't know how to work with them themselves. Which doesn't really help if you want to find out if the thing still works. All I could do when I went to pick the machine up, was to check if all the bits shown in the manual were accounted for (I searched for machines with manuals in the first place and I'm glad I did). Then, there were the more sophisticated and more expensive machines: some double bed machines, some with punch cards and some which could be controlled by computer (watch out with those. A lot of the second-hand ones have their software on floppy disks…). 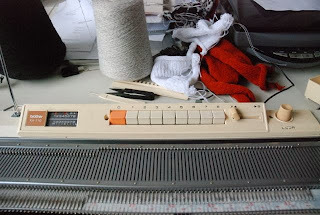 My knitting machine is a single bed one (which means you can't knit cables and real rib knit). It has room for 200 needles although I don't have quite that many (the lady at the store calculated that 180 should be enough to knit for my size and recommended I buy a few more than that). All the needles are held in place by the sponge bar (which you can't see here, it's on the inside. 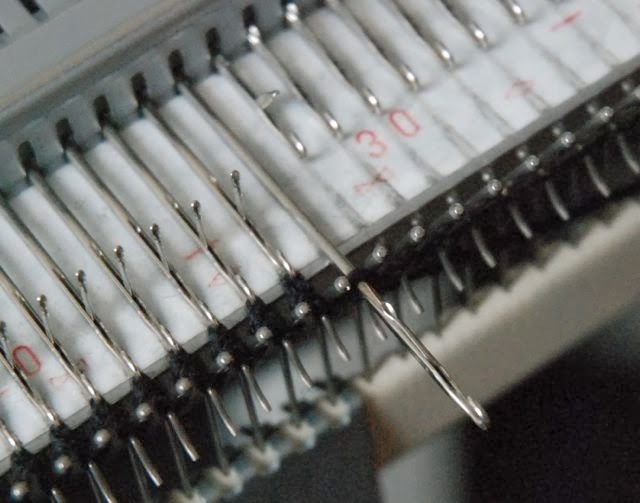 You have to take it out to change the needles though). You have to fix to machine to the table using two special screws. Some fancy machines come with their own tables, but most simple ones are like this. The needles can be placed in various different settings, as indicated by the letters at the edges of the needle bed. You need those for different stitches. To knit, you have to place the sled on the needle bed. 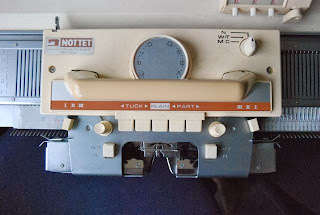 This one has all kinds of buttons, but the only important one for normal knitting is the dial in the center, below the handle. That's to set the tension. 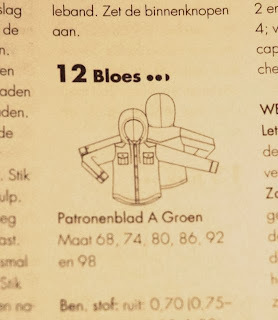 And attach the thread guide to it (Oh, I should mention that my manual is in Dutch and French. 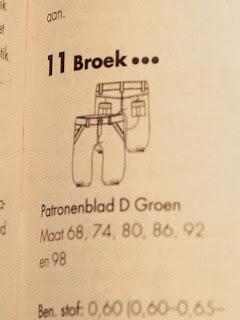 I'm just translating the names of the various parts so I may be getting all of them wrong. I'm only sure about the term 'sponge bar' because someone mentioned that in the comments the first time I blogged about the knitting machine). 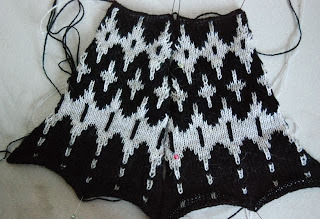 The whole thing should move smoothly over the needles. Then you can put the other bits on. This strange, spindly contraption is the thread tension unit. 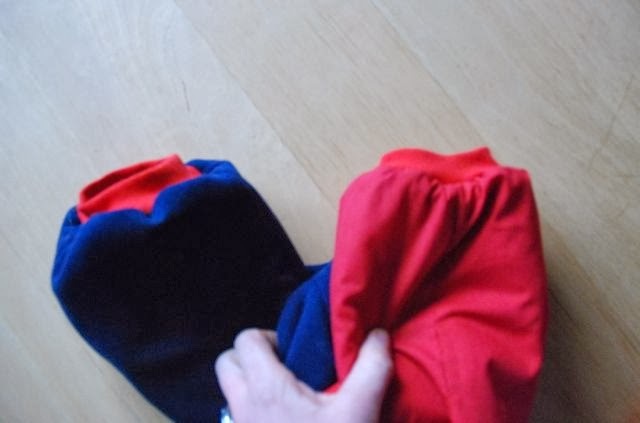 It's typically folded up in the box so you have to unfold it and insert it into a hole in the machine. 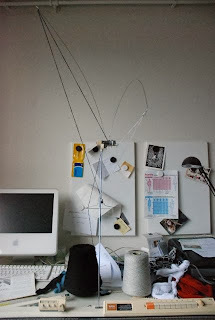 Then you take the yarn from the cone (only one for normal knitting), guide it through it and put it in the clamp on the shaft (that's the yarn's waiting position. you put it there until you're ready to put it into the thread guide of the sled). You can also click on the row counter. 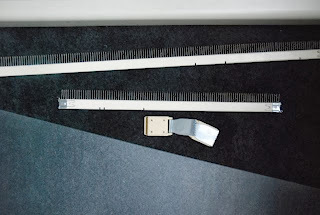 The lump of plastic sticking out at the right side of this simple gizmo is hit by the little metal bar on the sled on each pass and so it mechanically counts the rows. My machine also has this collection of buttons. These are all for various fancy stitches. If you just want to do plain knitting, you don't use them. 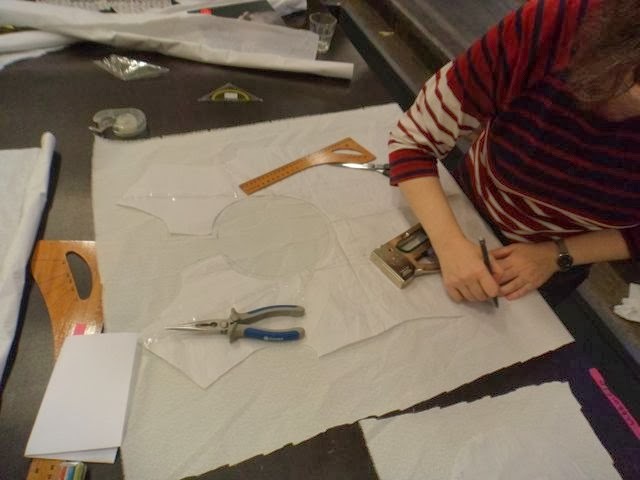 There are a some tools which came with the machine and are really useful. 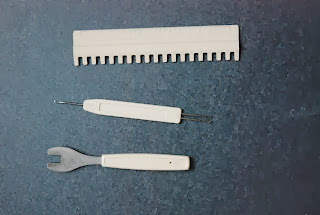 The little ruler is used to push needles forward in knitting position. It just makes that easier. The middle thing is one you absolutely need. 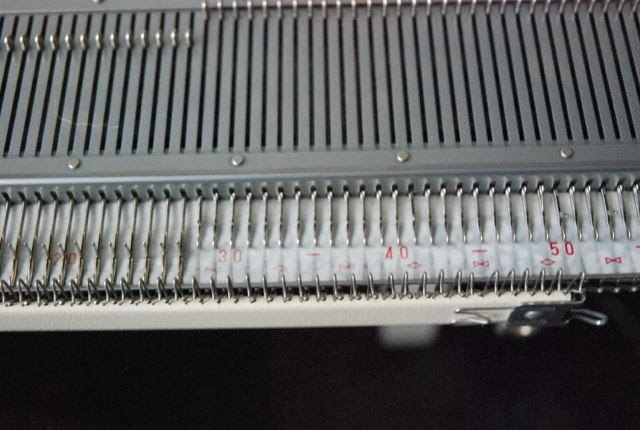 It's a helping needle which you use to transfer a stitch to another needle, like you have to do to bind off stitches. The thing on the bottom is the handle to activate the settings for the fancy stitches (so a simpler machine won't have one of these). 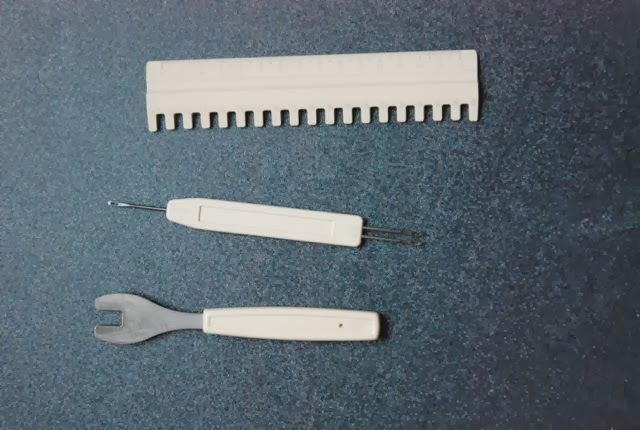 You will also need these: these combs provide the easiest way to set up stitches and the weights are put on later to let the work hang properly. 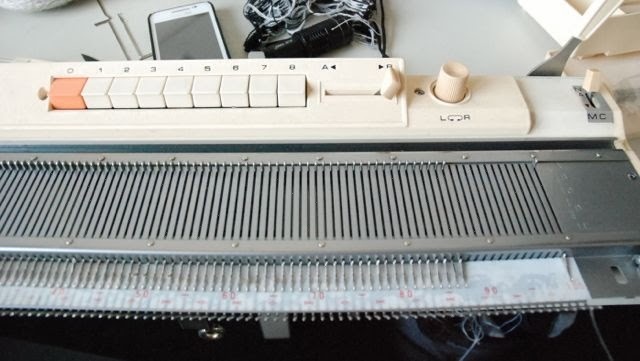 As I mentioned before, there are many different kinds of knitting machines, however, I suppose a lot of features are pretty universal. 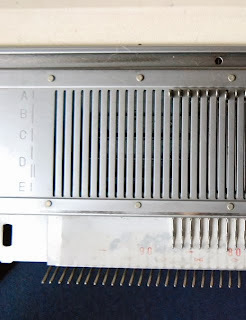 I hope this post is of use to you and I'll be back soon to show more about working with the knitting machine. It's finished! The combination of me and the knitting machine really did it this time! As I told you in the previous post, I set out to knit this cardi from the Margriet Knitting Show magazine (a yearly knitting special from the makers of Dutch women's magazine Margriet) from 1956. I should mention that technically, this is not a cardigan. 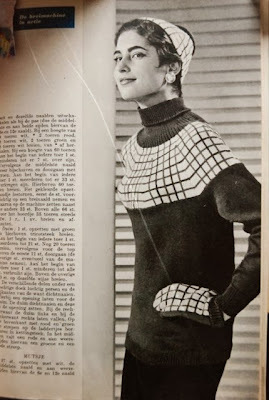 In the pattern description, Margriet calls it a "dressy knitted blouse" and in the commentary next to the photograph they refer to it as an "elegant evening sweater". They also mention that it's best made in black. My version is altogether more casual. Although I have half a cone of black yarn in the same gauge, I decided to use this beautiful deep burnt orange. I also didn't put the bias cut woven hem and neckline on. Those are supposed to go over the knitted edges but I didn't have any matching fabric. And I decided against the hem band at the very start because I thought fabric might not be as stretchy as the knit. 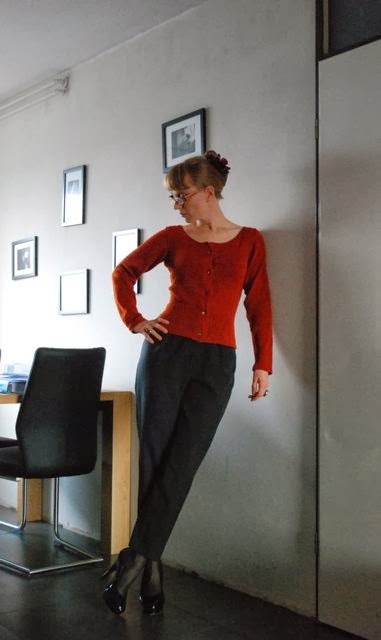 This is a rather shapely cardigan/blouse/sweater which made me worry about the fit. 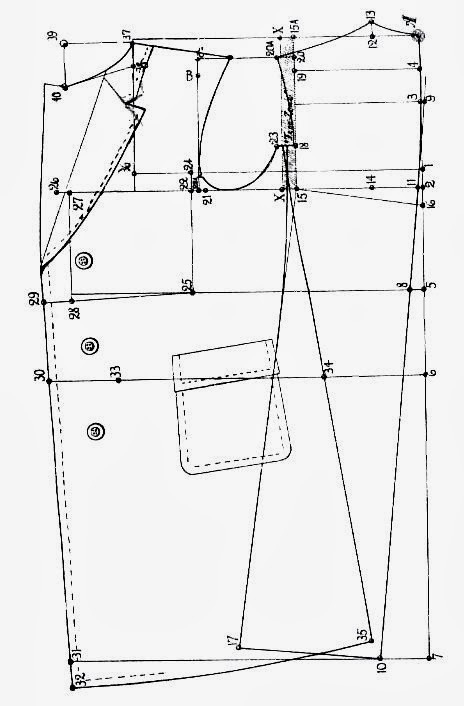 My bust-waist-hip ratio is fairly close to that of the Dutch 1950's sizing tables, but from my experience with a Marion sewing pattern, I learned that I may be a bit taller. And then there was the pattern description which didn't include a test for vertical size and described a lot of the knitting in centimeters rather than in rows (and you can't really measure the length of your work on a knitting machine because it is stretched out by the needles, which makes is look shorter). So, when I started knitting, I counted on my test square how many rows went into a centimeter and went from there. 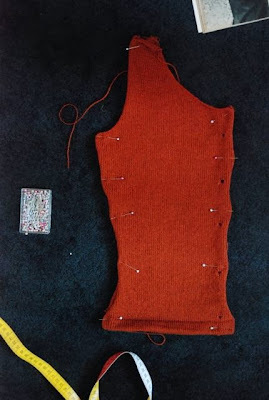 And obviously, I couldn't really test the whole thing until I had knitted everything, blocked the pieces and sewed them together. And I was not disappointed. In fact, the fit is rather close to what you can see in the original picture. 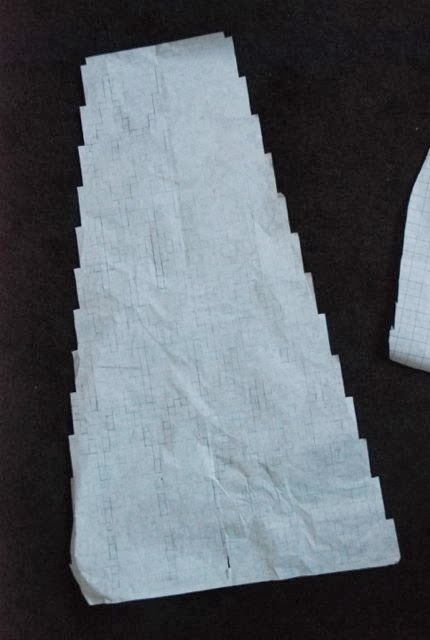 The sleeves could have looked better if the sleeve heads were just a little higher and more shaped, but that's the pattern's fault. I made one real mistake while knitting, which was making the buttonholes half the described size. Which just meant I had to find small buttons. 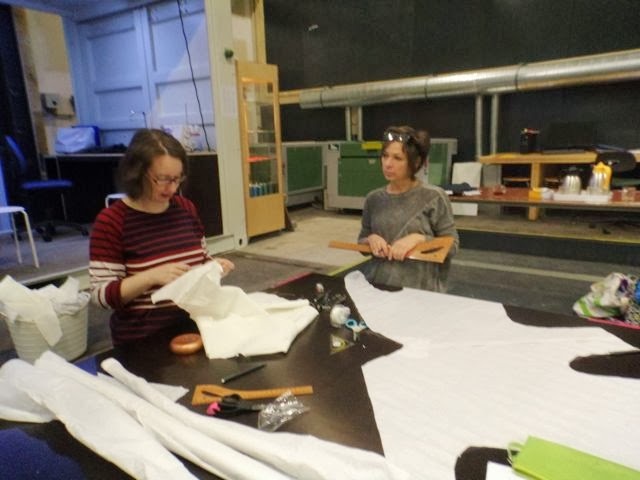 To keep the front opening straight in the fitted bodice, you have to attach a length of 4 cm wide grosgrain ribbon along the front edge. 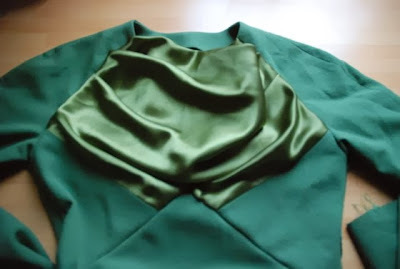 And then cut the buttonholes in it and finish them by hand. It doesn't look very neat on the inside but it works. This is not a very typical 1950's garment but it doesn't look 'standard' either. And I think it suits me. 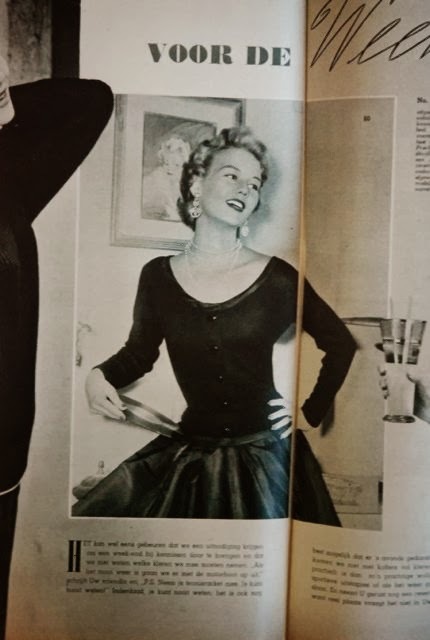 Oh, and I noticed while knitting and looking at other 1950's knitting patterns, that the front and back of this garment, and indeed of almost all the other ones as well, are shaped in exactly the same way (apart from the neckline, that is). 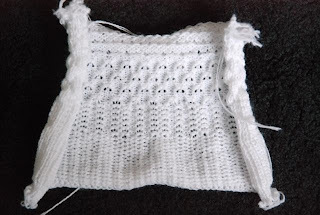 That may be normal to experienced knitters, but to me, a knitting newbie and experienced seamstress, it was a bit odd. And it means this thing can also be worn back to front. Which I kind of like as well. I'm very happy with this first real knitting project and I'm already eyeing up potential next projects. 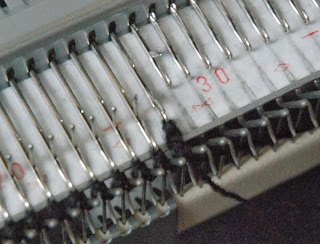 And I will do a post about the technicalities of machine knitting as I know them next week. 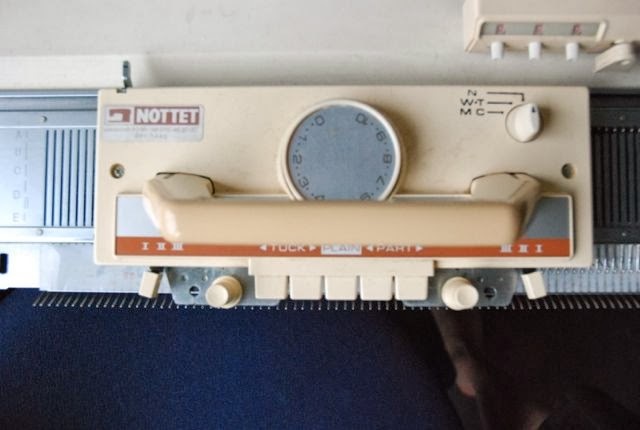 For the benefit of those of you who are (like I've been for a long time) interested in, but ignorant about knitting machines. P.S. My apologies for the big pictures which don't fit in the template. Blogger has weird issues with uploading pictures right now, so they only look right in the original size. I don't knit. Not really. 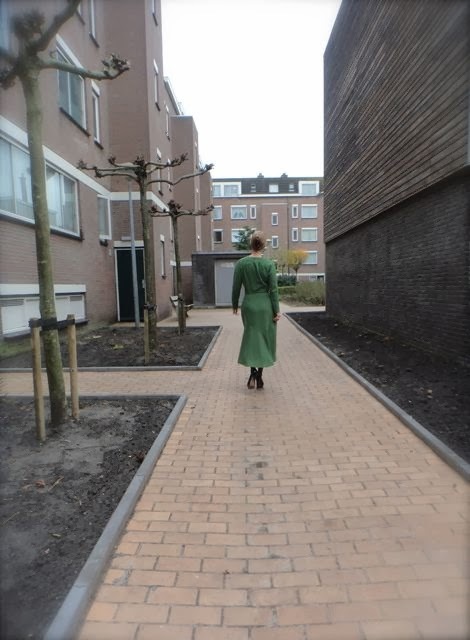 I have knitted a cardigan and a short sleeved sweater a couple of years ago. Both from modern patterns, using the exact yarn they were designed for. Both took me a very long time to finish. And they made me decide knitting just wasn't for me. 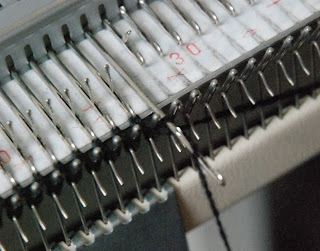 Several intricate movements just to shape one stitch… I don't have the patience for that. I know the work goes faster if you use chunky yarn but those are expensive and their thickness means you end up with a seriously warm finished product. Too warm for my normal use. Then, over a year ago, I bought a second hand knitting machine. It's seriously vintage. This Brother 710 is (at least) more than 30 years old. With quite a bit of fussing around, and the aid of the manual, I managed to get it to work. Sort of. I made a thing. Then, I bought some second hand cones of yarn for it. I tried knitting with some of those, and it didn't work. The thread kept breaking. After that, I gave up for a while. 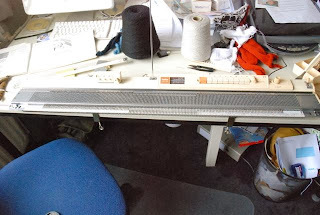 The only place I had for the knitting machine was on my sewing table. So, trying to knit meant I couldn't sew. So, it was no contest really. Now, that has changed. I bought a laptop a few months ago which means I can (partially) clear my desk. 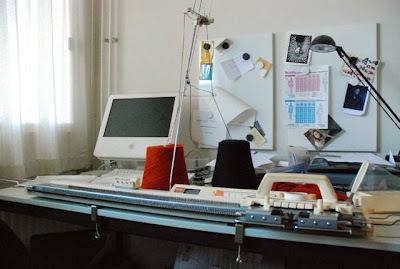 Which means I could put the knitting machine there. So, last week, I took the old thing to a store (one of only two in the Netherlands) where they sell and repair knitting machines. Considering how busy they were while I was there, the good people of ABS don't need my recommendations, but they definitely deserve them. They didn't have a problem with servicing such an old machine, were really knowledgable and very helpful. The machine got a new sponge bar and some new needles and I got some valuable snippets of instruction (it's a 1,5 hour drive from my home to that store, so taking one of their courses is not really an option. If I lived closer, I'd do that). I also got some tips of how to deal with that breaking yarn. Apperently, old yarn gets too dry which makes it break easily. You can make it useable again by spraying some water over it in a fine mist (just with the yarn on the cone. And then you let it dry of course). 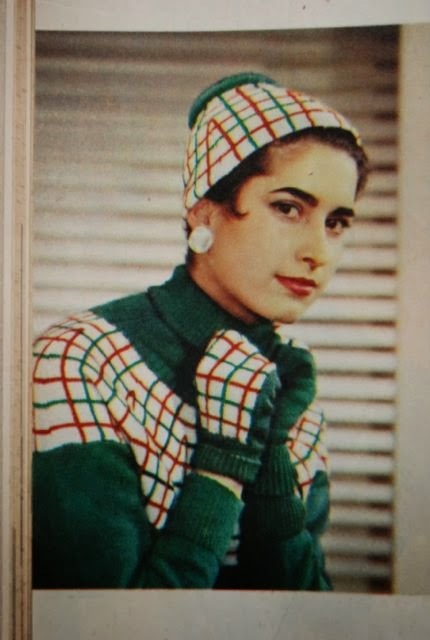 I am trying to make this lovely cardigan from 1955. It's a lovely design and according to the test square, my yarn has the right gauge for it. 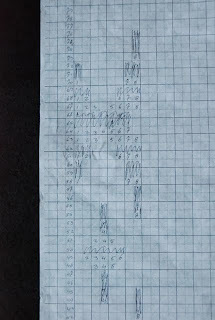 However, the pattern doesn't make things easy with the way it alternates between talking about centimeters and rows. I had some weird accident (user error, no doubt) when trying to knit the back neckline which means I'll have to re-do the entire back. But the fronts (here pinned together to check their sizes) are finished. I think I'm getting the hang it and I'm looking forward to the finished item. Little J's winter suit is finished! 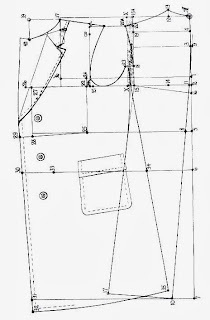 I explained a lot of its details in the previous post: modified Knippie patterns, wool coating and interlining, cotton lining and rib knit. I bagged the lining of both garments, catching that rib knit between the layers. At those really small hand leg and arm openings, that was really fiddly. 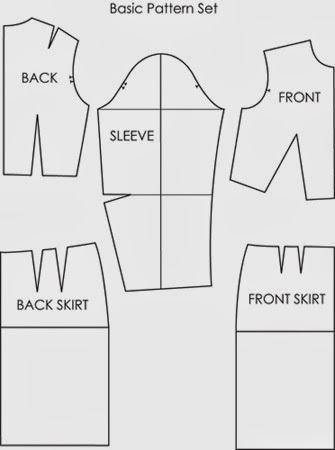 And of course, I had to make the separating zipper quite a bit shorter. The zipper, by the way was also sewn in from the inside so there is no visible stitching there, not even on the flap behind it. All the jacket still needs is a red lace for the hood. Unfortunately, I went to four different places (three market stalls and a store) which sell notions and none of them were selling laces anymore. I would have expected at least one of them to sell the stuff by the meter, I know they used to. And I'm thinking only now that I should buy actual shoe laces instead. On this small size, their length should not be a problem and those will have nicely finished tips… I should have thought of that earlier. Now, all I have to do is hope that it will fit J and he and his parents will like it. After all that time spent agonizing over the details of the 1930's inspired dress, it seemed to be time for some un-selfish sewing. My sister's son in six months old now and looking forward to his first winter. He has a coat, but his mother requested a kind of coat suit (two pieces) which he can wear on bicycle rides (riding in a child's seat on the handlebars of one of his parents' bikes, obviously. 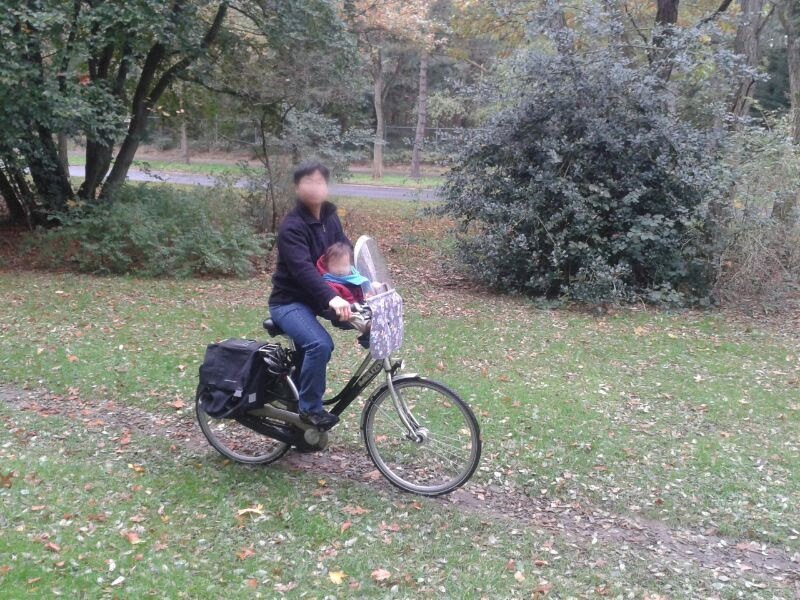 No idea how common that is anywhere else, but here in the Netherlands, parent cycle with small children like that all the time). 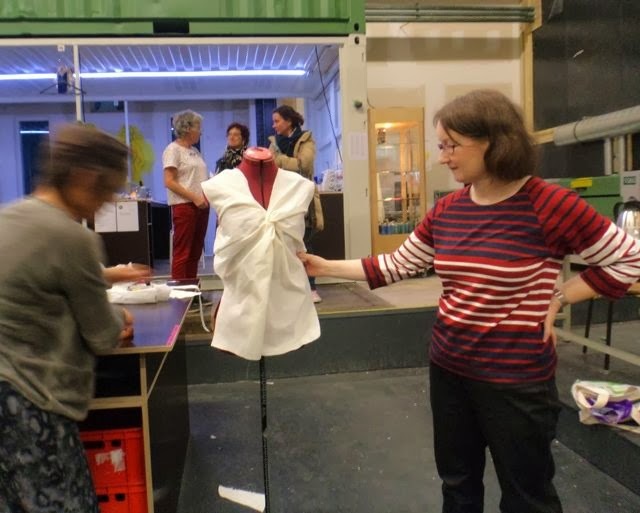 And she preferred the outfit to be made from all natural fabrics. 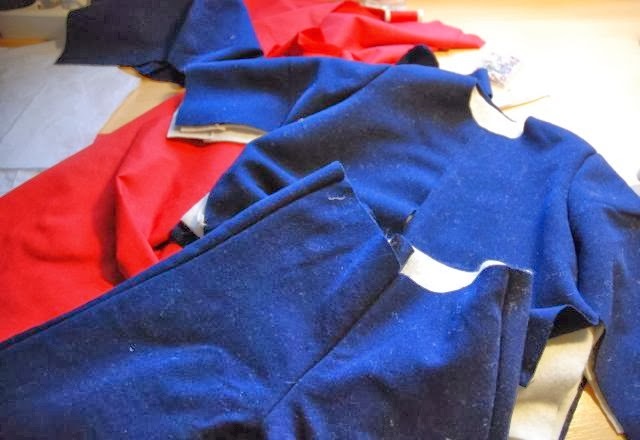 Because of that, I'm using thin blue wool coating for the outer shell, un underlining of thick boiled wool knit and red cotton for the lining. And red cotton rib knit. A couple of weeks ago, I sent her some sketches to find out what kind of outfit she was looking for. She liked the hood, preferred a zipper closure, in the middle and thought my idea of using rib knit to keep the wind out would be good. 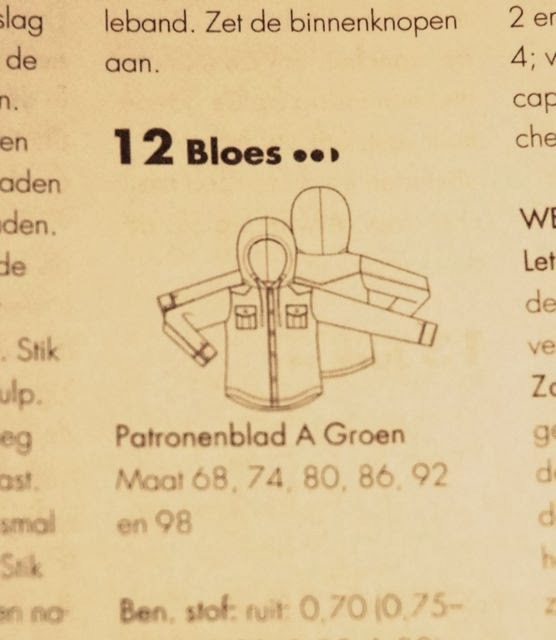 So, I went to the library and borrowed the 2011 collection of Knippie magazine (the children's version of Dutch sewing magazine Knipmode). I made quite a lot of changes to the shirt. I went up a size in width for the ease needed in coat, replaced the button band with a zipper and made the bottom edge straight so I could at a rib knit band. I'm working on it now. I really hope it will fit. 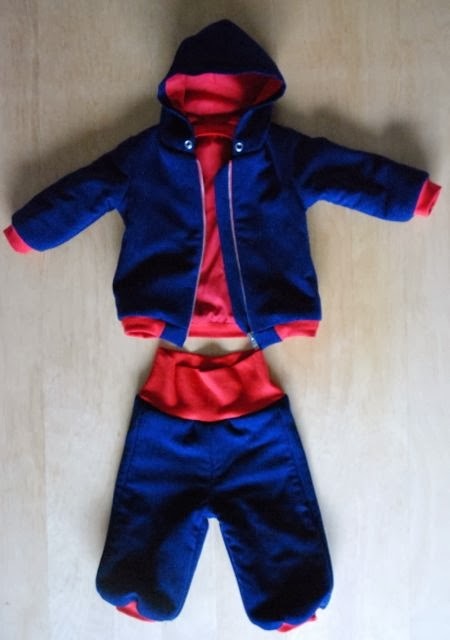 Baby clothes really through off my sense of proportion. I just have no idea. 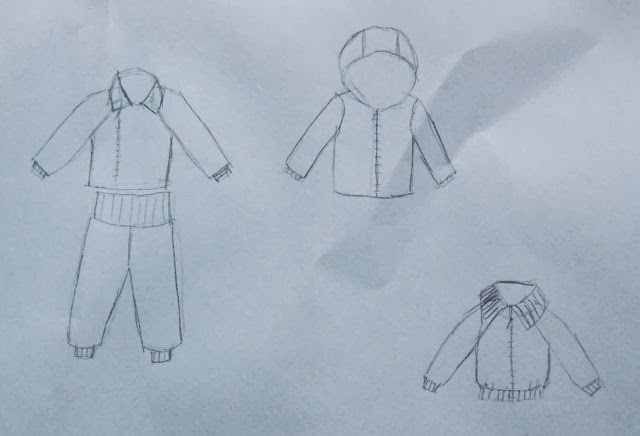 I'll show it to you when it's done but I probably won't be able to give the outfit to my nephew until the end of the month. It's really finished! In the end, I didn't line the dress, I'll make a full slip later. 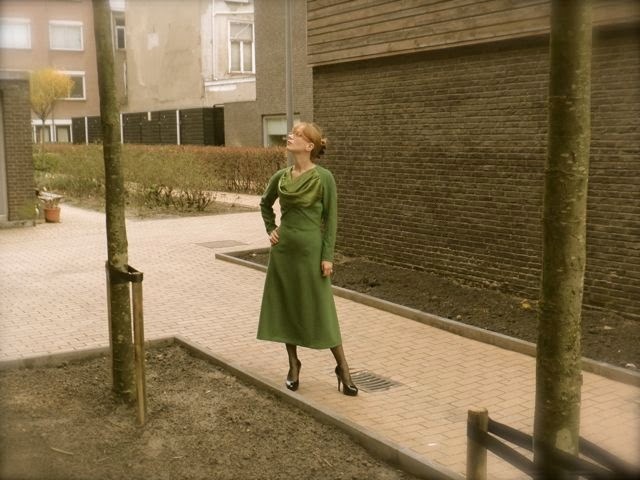 As you may know by now, from my previous posts about this project, I didn't use an actual 1930's pattern for this dress. Instead, I took inspiration from the wonderful images in magazines from the era. One of the advantages of owning several magazines, spread over most of the years of the decade, is that you get to see the progress of fashion over time. 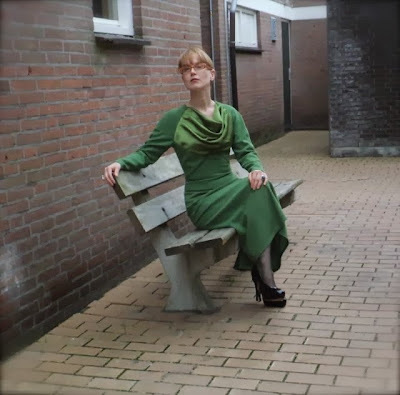 That way, I learned that there were no shoulder pads in dresses before 1932 and even in that year, fullness at the shoulder was more often achieved by gathering than by stuffing the sleeve head. Also, in 1930, waistlines were still just a bit below the natural waist, they gradually rose during that year, to reach the true waist by 1931. At that time, the commentary in the magazines thought the dresses were very fitted but in fact, all bodices still had some blousing above the waist. 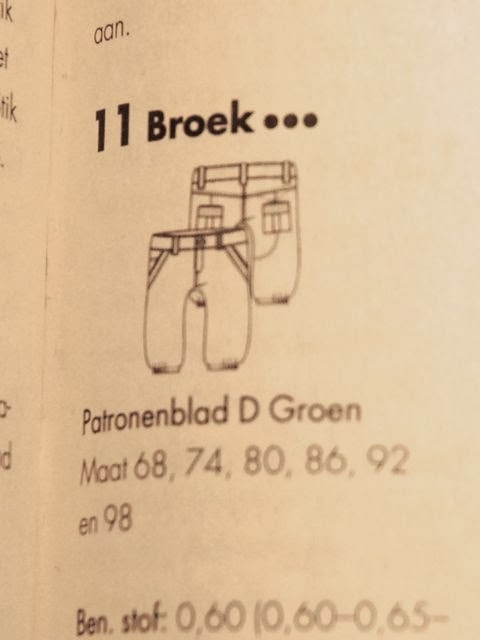 The completely streamlined effect didn't really show up until about 1935… At least, in the Dutch issues of Gracieuse magazine. And in the French Petit Echo de la Mode. Anyway, like those early 30's dresses, mine doesn't have shoulder pads. It has raglan sleeves and a satin cowl neck bodice with pleats. It fits at the natural waist at the back and rises to a point at the front (like so many original 1930's dresses). 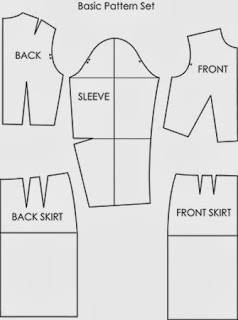 The basic shape of the skirt is straight and ever so slightly flared but from the side front (at both sides) a more flared piece is inserted which runs all the way to center back (like I sketched here). The skirt is probably a bit short for a 'period' look but should work just fine for the twenty-first century. The silhouette is still quite new to me even though the dress is very comfortable. I've been looking at those 1930's magazines a lot lately and I quite like them. So, there may be more garments inspired by them in the near future.